In 1865, Washington Duke of North Carolina was released from Libby Prison, having been captured during the Confederate army's retreat from Richmond. He was sent to New Bern, North Carolina - 137 miles from his 300 acre farm four miles north of Durham. A federal soldier gave him 50 cents for his 5 dollar Confederate note, and with that Duke set off, walking 137 miles to his home and the beginning of a true American success story. Brightleaf Tobacco: There was little left of the farm except for a small amount of Brightleaf tobacco. Duke subsequently sold some of his land and became a tobacco farmer. With his family's help, he pulverized and cleaned the crop in a small log barn. Then he packed it into muslin bags and labeled it "Pro Bono Publico" -- for the good of the public. The first wagon load he took to Raleigh was drawn by two blind mules. Duke & Sons: The company expanded rapidly from 1870-1890. Washington Duke brought his sons into the business and grew from a shed on his farm to a series of larger and larger factories in downtown Durham. 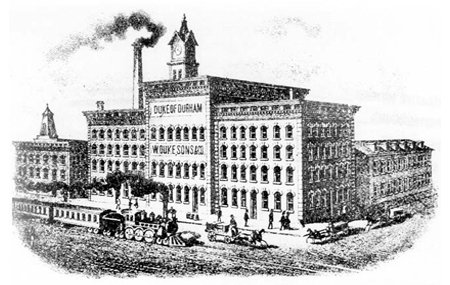 Duke & Sons found itself in tight competition with the Genuine "Bull" Durham Tobacco Factory. James Buchanan "Buck" Duke, decided the company could generate much needed profit for the relatively small but growing cigarette market. He succeeded in this area so well that in 1890 his four biggest rivals joined him and he became president of the new firm - The American Tobacco Company. In the early 1890's, Washington Duke left the business for his sons to handle while he became involved with local affairs, including bringing Trinity College to Durham. Trinity College became Duke University in 1924. Industrial Power House: The company was one of the original 12 members of the Dow Jones Industrial Average in 1896. The American Tobacco Company dominated the industry by acquiring the Lucky Strike Company and over 200 other rival firms. Antitrust action begun in 1907 broke the company into several major companies in 1911. American became the biggest tobacco company in the world with successful products such as the unique, "toasted" tobacco in the Lucky Strike brand. 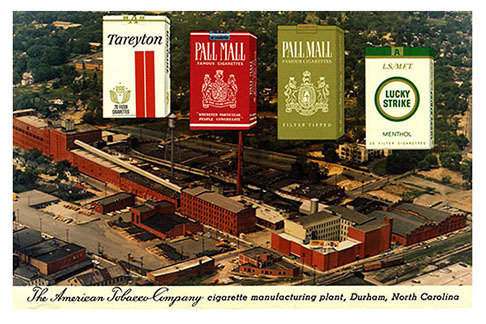 Pall Mall and Tareyton also ranked among their successes. American even enjoyed the help of celebrities such as Frank Sinatra and Jack Benny in its promotional efforts. The American Tobacco Company, which started acquiring a wide range of non-tobacco products during the 1970s and 1980s, renamed itself American Brands in 1986, and has since been renamed Fortune Brands. 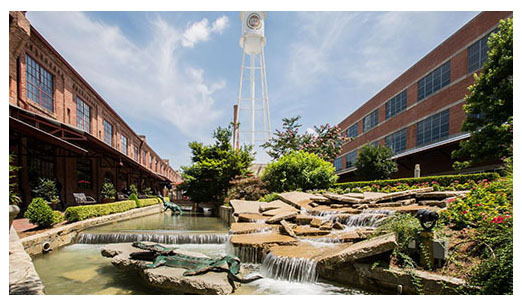 American Tobacco Historic District: Although cigarettes are no longer manufactured in Durham, the American Tobacco Historic District preserves the physical legacy of one of America's great entreprenurial success stories.